Please contact owner Dale Email: Daljrt@me.com - Mobile Phone: 510-376-6955. 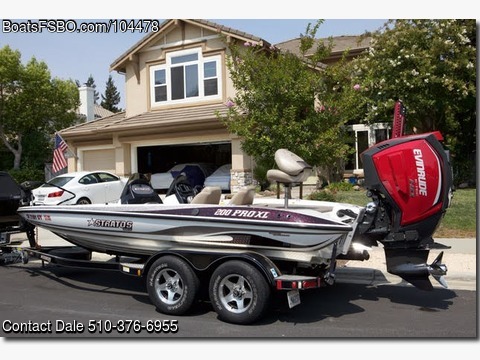 This is an awesome Bass Boat with the new Evinrude 225 E-TEC HO Engine with Raker 4 SS Prop, Super Low Hours and Still Under Warranty. Always Covered, New Full Gauges, and Everything is on One Screen. Must see all the options! Bob's Machine Hydraulic Jack, 10 FT Power Pole, 112 LB Thrust Minnkota Trolling Motor with LED Headlight, 2 Color Hummingbird Fishfinders with Side Imaging, 3 Group 31 Batteries and One Starting Battery with Built-in 4-bank Minnesota Charger, 2 Separate Live Wells, Plenty of Super Storage, Built-in Cooler, Carpeting, Bilge Pump, Coast Guard Package, and Anchor. You must see this boat! Great Fuel Economy, 70mph as per GPS ON PLANE IN 2.5 SECONDS. Matching Stratos Tandem Axle Trailer, with Slide-in Tongue, and a Brand new cover. Professionally Maintained, and Always Fresh Water.